The Australian apparently asserts that the commission did not look at enough weather stations to provide an accurate overview of changes in hot weather in the Sydney region. It published five graphs of changes in hot weather, the original two from the commission’s report plus graphs for Sydney Airport, Bankstown Airport and Prospect Reservoir. However, these other graphs confirm precisely what the commission has shown – that the number of hot days in western Sydney has risen during the past four decades and has risen at rate greater than that for the eastern suburbs. 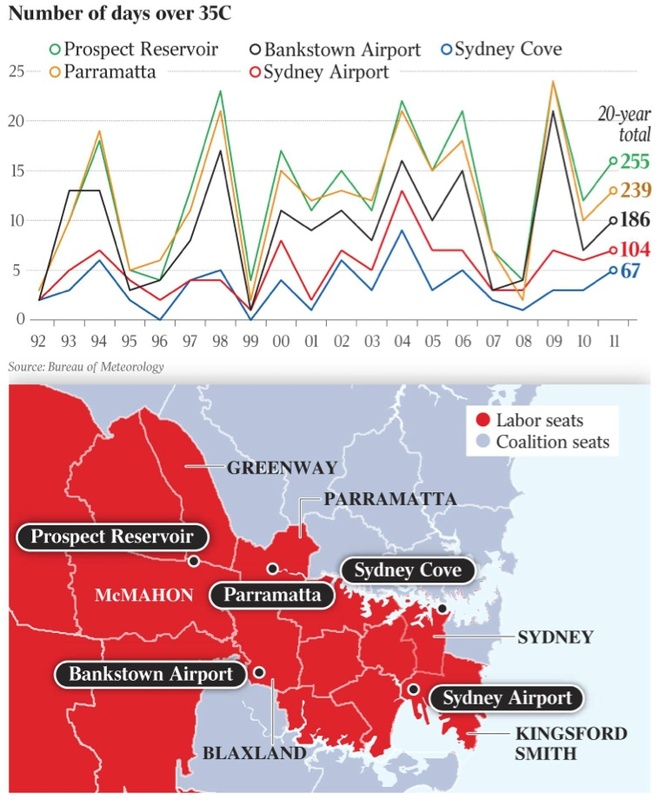 In fact, the commission erred on the careful, conservative side by not including the station at Prospect Reservoir, which showed a much more pronounced trend than either Parramatta or Bankstown Airport. In fact the trend is an increase of about 200 per cent in hot days since 1965. The Australian said in its editorial: “We accept that the majority of scientific opinion says human-induced carbon emissions are contributing to a warming climate.” That is correct. It could have added that human-induced emissions are the main contribution to observed warming in the past half-century. Then it would have been spot-on. Steffen has no idea whether human emissions are the “main contribution” to recent warming because no-one does. It’s all based on incomplete climate models. And the debate is far from phoney, despite the usual attempts by the consensus side to shut it down. If human effects are small or even of a similar order compared to natural variation, then every dollar we spend trying to mitigate climate change is a dollar thrown away. In other words, until we know climate sensitivity precisely, all of this is based on the precautionary principle, except the costs far outweigh the benefits. And as for “solutions to the climate change challenge”, I would be grateful if he would kindly explain what the government proposed solution of a carbon tax will actually do for the climate, when China and India’s increasing emissions will swamp anything Australia can achieve unilaterally. Actually, don’t bother. We know the answer: NOTHING. In any case, why should we trust the Climate Commission at all? There’s no dissenting view present, no alternative opinion to consider, nothing to challenge the accepted consensus, no case for the defence. It’s just a bunch of like minded climate activists pushing AGW propaganda to prop up the government’s climate policies. Apparently, to be a “climate scientist” or “Climate Commissioner”, one must dismiss all other unknowns as being insignificant while trying to make the “correct” unknown significant. So the MWP does not count because despite evidence of it in Europe, North America and Australia (and no counter evidence anywhere) it was not deemed to be global enough. But a part of Western (not Eastern, only western) Sydney is sufficiently global to prove CAGW (or whatever it is called now). In my opinion Steffen is either dishonest or stupid or both. In my opinion the kerfuffle over phony death threats, which can’t be produced by the supposed targets, was concocted for this purpose alone. To avoid a bloody result for the Will Steffens of the world. Because in the back of their minds (and out of their lips when in secure locals among confederates) they know what the price of justice should be for their crimes against humanity. Q: Can the Climate Commission categorically say that human CO2 emissions are the main driver for an apparent increase in recent warming? Q: Can the Climate Commission categorically say that the carbon dioxide tax will lower the temperature thus saving us from the apparent catastrophic consequences of global warming? Q: Can the Climate Commission categorically say that ANY solutions to apparent climate change will in fact work? So then, who are the one’s manufacturing a phoney and divisive “debate” on climate science? The Climate Commission is a mutual admiration society, set up by a global warming-believing government, to spread the global warming gospel. It has absolutely no credence. The drought between 2002-2009 would make the figures skewed, since with less rain the weather is warmer, especially away from the cooling effect of the coast, and thus areas away from coast would be skewed to have more hot days, simply because the weather is drier. The 90s were relatively wet, the 2000s were dry, so this alone would make more hotter days away from the coast, irrespective of any external warming trend….